Scott Greene, SVP, Corporate Strategy & Business Development of Fruit of the Loom Speaking for Kentucky Live! Scott Greene, Senior Vice President of Corporate Strategy & Business Development for Fruit of the Loom, Inc., gave a talk on the evening of Thursday, April 9, 2015 at the Barnes & Noble Bookstore in Bowling Green, KY for the WKU Libraries-sponsored “Kentucky Live!” speaker series. He talked about Fruit of the Loom as one of the nation’s oldest brands. According to Mr. Greene, Warren Buffet acquired Fruit of the Loom for $835 million as a Berkshire Hathaway Company in 2002, and since then has acquired various brands including Activewear, Jerzees® Activewear, Vanity Fair®, Bestform®, Lily of France, Lou® Paris, Curvation, Spalding, Dudley® Sports, American Athletic, Inc., Bike, and Russell Athletic. Comments Off on Scott Greene, SVP, Corporate Strategy & Business Development of Fruit of the Loom Speaking for Kentucky Live! After speaking at the Gary Ransdell Hall on WKU campus as part of the “Tracing the Unexplored: An Ecuadorian Tapestry” series in the afternoon of March 26, 2015, Ecuador’s most famous “caricaturist” Xavier Bonilla, also known as “Bonil,” spoke for the WKU Libraries-sponsored “Far Away Places” speaker series off campus at the Barnes & Noble Bookstore in Bowling Green on the evening of the same day. 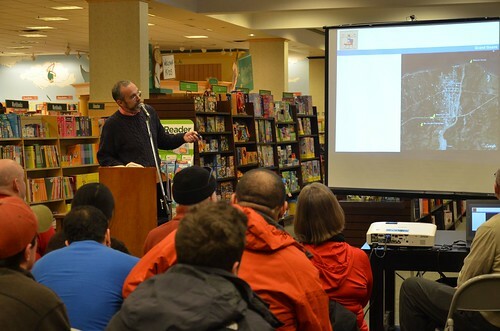 Paul E. Fallon, an architect from Massachusetts who specializes in healthcare design, gave a presentation on his architectural design experience in Haiti, an earthquake-prone country in Central America, to an audience mostly of WKU students of architecture at Barnes & Noble on February 19, 2015. The presentation was part of the WKU Libraries’ “Far Away Places” speaker series. Mary Ellen Miller, an English professor of WKU, talked about the life and literary talent of her late husband, Jim Wayne Miller, a renowned writer and pioneer of Appalachian Studies and a distinguished and revered teacher that she and Morris Allen Grubbs have written about in the book Every Leaf a Mirror: A Jim Wayne Miller Reader. The event took place in the Kentucky Museum on the evening of February 12, 2015. 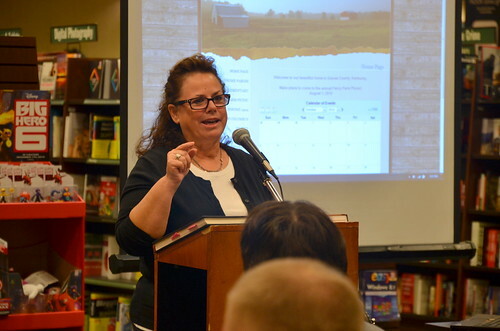 Associate Dean of Special Collections UK and Co-Director of the Wendell H. Ford Public Policy Research Center, Deirdre A. Scaggs spoke for the WKU Libraries’ “Kentucky Live!” speaker series at Barnes & Noble, Bowling Green, KY. Associate Dean of Special Collections UK and Co-Director of the Wendell H. Ford Public Policy Research Center, Deirdre A. Scaggs discussed her book written with co-author Andrew W. McGraw titled The Historic Kentucky Kitchen: Traditional Recipes for Today’s Cook. 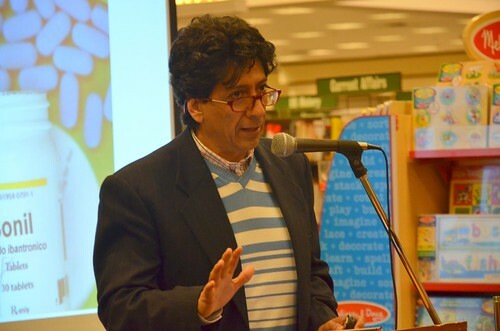 The discussion was part of the WKU Libraries’ “Kentucky Live!” speaker series partnered with Barnes & Noble Booksellers in Bowling Green, KY, where the event took place on the evening of November 13, 2014. Allen Dossey, Proprietor of the Purple Toad Winery in Paducah, KY, is talking to a Bowling Green community audience at Barnes & Noble for the Kentucky Live! event co-sponsored by WKU Libraries and the bookstore. WKU Libraries kicked off the 12th season of KY Live! speaker series with a program about one of the newest and most acclaimed vineyards and wineries in Kentucky started by WKU alum Allen Dossey. The Purple Toad Winery sits on the edge of Paducah, Kentucky and includes a tasting room, walkable vineyard, and a facility that can be rented for parties, weddings and other social events. The event happened on the evening of Thursday, September 11, 2014 in Barnes & Noble Booksellers in Bowling Green, Kentucky. The bookstore is a partner of the talk series with WKU Libraries. Librarian Chris Robinson-Nkongola welcomes patrons to the newly renovated Glasgow Library. This renovation is phase 1 of the makeover. Phase 2 will take place next year with a new circulation desk and carpets. Future site of circulating collection. The circulating collection will include a McNaughton Leisure Reading Collection. We have new laptop chairs with swiveling tables and a Courtesy Charging Station. WKU Glasgow will also have 10 new state of the art all-in-one widescreen Dell computers (approximately 24 inches). Brian E. Coutts received the Marta Lange/SAGE-CQ Press Award from David Horowitz, Vice-President of Sales for CQ/SAGE at a June 29, 2014 luncheon for the Law and Political Science Section (LPSS) of the Association of College and Research Libraries (ACRL), a division of the American Library Association (ALA). The luncheon was held at Bally’s Hotel and Casino in Las Vegas. The award, established in 1996 by LPSS, honors an academic or law librarian who has made distinguished contributions to bibliography and information service in law or political science. It consists of a plaque and a check for a $1,000. This award honors Marta Lange, 1990-91 Law and Political Science Section (LPSS) Chair, whose exceptional talents as a leader were enhanced by a wonderful collegial spirit. Her bright career, cut short in a fatal automobile accident in 1992, was an inspiration to others and a model of professional service. WKU Libraries’ Kentucky Live! talk series featured Dr. Gloria Nixon-John and her book The Killing Jar at Barnes & Noble on the evening of March 20, 2014. The book tells a compelling story of a fifteen-year-old who served nine years on Death Row in Eddyville, Kentucky. The author, Gloria Nixon-John, provides documentation for the many problems this youngster endured, and how those who misread the signs condemned him to death.